I looooooooooooooooooove Etsy, so I'm quite surprised I haven't shared some of my favorites with you on this blog.....although I do try to keep things Baltimore + Food related. However, I just had to share this picture with you by ArtSharkDesigns, who hails from the NOVA region. This adorable print is $15 at the shop. Doesn't it look like a page out of a storybook? I love it! And what a perfect gift for Valentine's Day or perhaps a recently engaged couple from Baltimore! 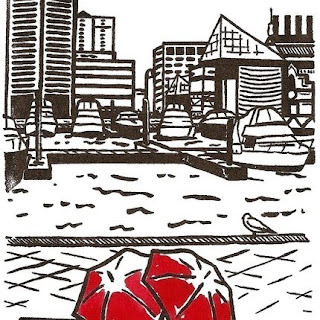 There are tons of other cities represented in the shop, all with the signature red umbrellas, but I had to show the Baltimore print here, of course! I love Etsy too! But I can't go on there without wasting lots of time...but it's good for a slow afternoon at work! I did some Christmas shopping from Etsy this past year, which worked out great. I'm probably going to do that more often. I'm an Etsy addict! What a cute print! Bria - That's a smart way to make your wedding super unique!!! I hope your planning is going well!!! I just had my very first sale at my brand new etsy shop! I will write to you about it in detail because of how TOTALLY FREAKING AMAZING the entire experience was. I am super duper proud of myself, yes I am.